Get maximum relaxation with revitalizing water caresses and the beneficial influence of colours. A selection of configurations to get immersed in a dimension of absolute wellness. The "rain" jet, just as a tropical rain, releases vigorous water droplets, which give both an energizing and revitalizing feeling. 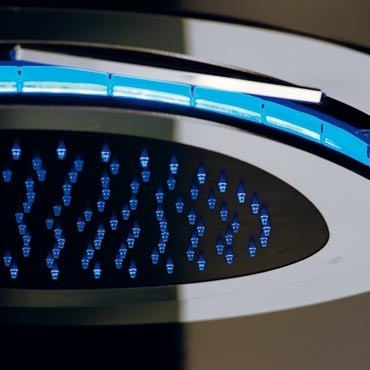 The "cascade" jet combines the emotion of a refreshing waterfall with a relaxing hydro massage on the neck area, always taking care of water consumption. The "nebulizer" jet is a relaxing drop concentrate able to give an exhilarating feeling, caressing and refreshing the skin with a wrap-around effect. The Synergy model multifunctional shower heads are characterized by a design inspired by nature and are made of stainless steel with chrome finishing, while the inside of the shower head is in DuPont™ Corian®. The version with a complete chrome finishing is also available. 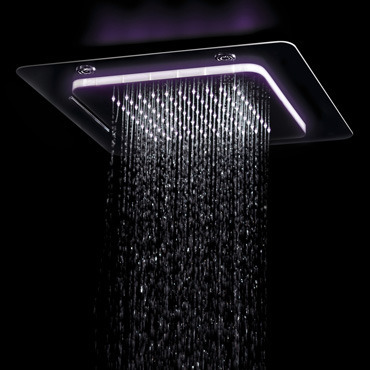 The multifunctional shower heads are equipped with chromotherapy effects and rain, cascade and nebulizer jets. 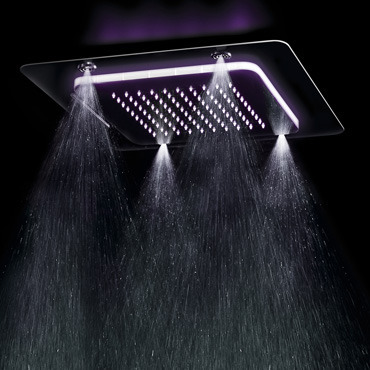 The shower head is equipped with an electrovalve allowing the passage from a water jet to another through a waterproof remote control, with which you can manage also the chromotherapy effect. The electrovalve system ensures an important advantage, not only functional but also in terms of installation: a traditional hydraulic system with a single pipe is enough to install this shower head, and not one with several pipes as for the other normal multifunctional shower heads, which makes it prerogative particularly suitable and convenient for renovation projects too. Discover the features of the multifunctional shower heads applied to the concept of Synergy: the unique design of natural inspiration, completely devoid of rules and geometries, blends with the pleasure of being able to choose between three types of water jet and between the eight colors of the chromotherapy effect. 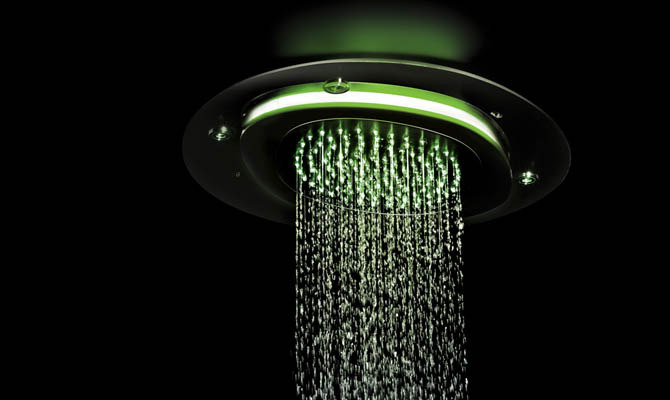 The shower head is equipped with an eight-colour chromotherapy system. By means of the waterproof remote control you can choose a colour among red, green, blue, yellow, purple, blue, violet and white or even start the automatic transition from one shade to another. 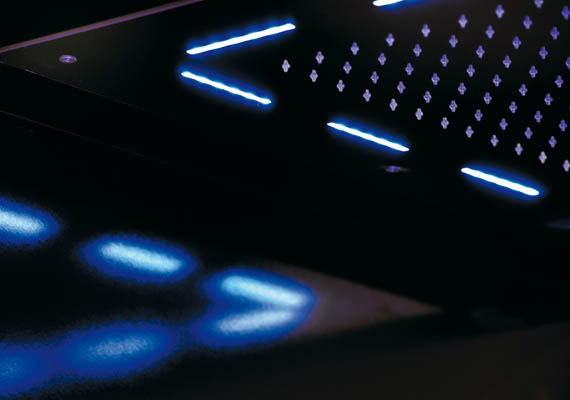 The chromotherapy system functioning is independent from the use of water. In the version with the inner part in DuPont™ Corian®, depending on the finishing, the light spreads through the shower head or exclusively through the side profile of the shower head and through the nozzles, giving a pleasant "starry night" feeling. 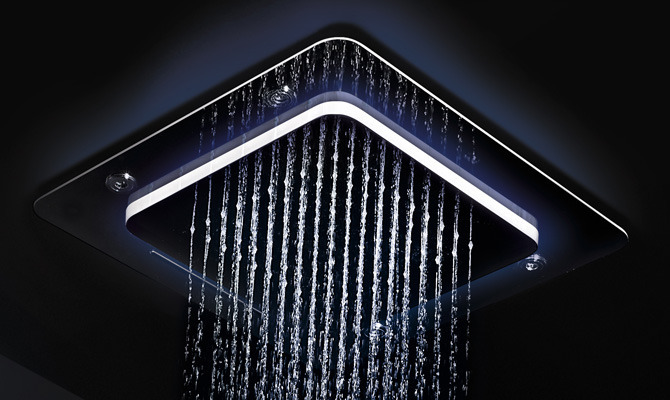 The Playone design creates multifunctional shower heads with square minimalist shapes. Made of stainless steel, and also with chrome finishing, they are equipped with rain, cascade and nebulizer jets as well as chromotherapy effect. Playone multifunctional shower heads, characterized by squared minimalist shapes, allow you to choose between the rain, cascade, and nebulizer water jets, but also among the eight colors of the chromotherapy effect: red, green, blue, yellow, purple, blue, violet and white. 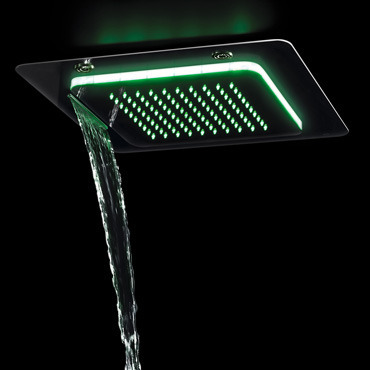 The 8-colour chromotherapy effect is available either on wall-mounted shower heads or the ceiling-mounted ones with rain jet. External part for built-in ceiling-mounted stainless steel shower head ø 380 mm. 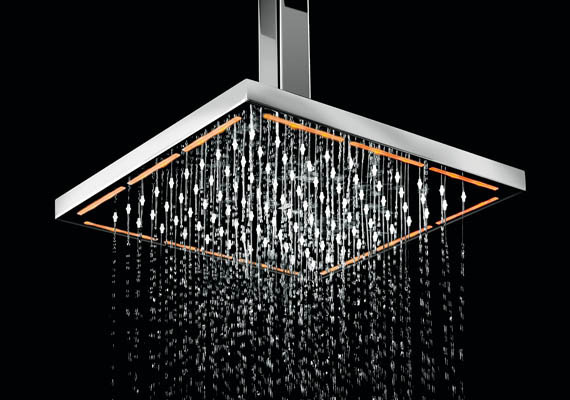 External part for built-in ceiling-mounted stainless steel shower head ø 500 mm.